The reasoning behind what the rhyme teaches us about true money goes back millennia. Medium of Exchange - Rather than the need to haul cumbersome goods, people found that they could use smaller merchandise for transport and trade. Gold is rare, portable and universally recognized, so serves well as a medium of exchange. Measure of Value - In other words, it allows trade according to a standardized value system. When peoples of differing regions perceived the value of items in terms of gold, it became easier to trade under such a standard. Trading camels for salt could then be accomplished more efficiently by comparing the value of each, measured in gold. Standard of Deferred Payment - This standard related to the acceptable means to settle a debt. 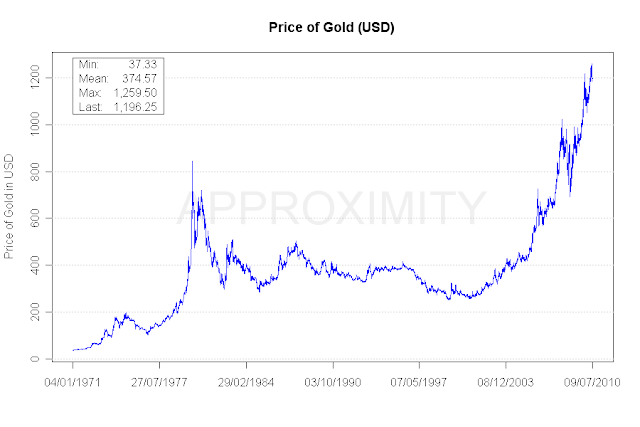 Gold, being stable in value, was widely accepted as the standard. Thus, the value of a debt when repaid with gold at a future date is equal to the value of the debt at the time it was incurred. Store of Value - It’s been estimated that the value of all fiat currencies combined should equal the value of all of the world’s gold. This is because gold’s supply is fixed. Its limited supply assures its place as a consistent store of value. The third point, “standard of deferred payment,” is missing from today’s textbooks for a reason. Fiat currency, because its purchasing power constantly changes through inflation and/or deflation, is not a reliable means of debt payment. If the currency drops in purchasing power (inflation), then the payment of debt becomes insufficient to cover the original value. If the currency rises in purchasing power (deflation), then the payment of debt exceeds the debt’s original value. With gold these tendencies become all but obsolete. This is because it fits the definition of true money. Gold is not just another pretty face. It’s a true store of value. It cannot ever be valueless, unlike fiat currencies, stocks, bonds or any other paper asset. Although many would argue against such claims, the evidence is irrefutable. Since the knot that tied the dollar to gold was severed in 1971, the greenback has decreased in value astronomically, while gold has pursued an opposite path of increasing value. The following graph illustrates this undeniable fact. In addition to gold’s limited supply and universal acceptance, other characteristics of gold that set it apart include the fact that it’s durable, portable and divisible. Durable – Archaeologists are often amazed at how well gold retains its shape and beauty over time. Even after hundreds of years buried in the earth, artifacts often retain intricate details. Gold is one of the few metals that neither rusts nor tarnishes. Portable – This is readily evident. A great deal of wealth can be carried or transported with minimal effort. Divisible – Many goods, such as livestock, pieces of art and mechanical devices cannot be divided for purpose of trade. However, gold can be divided and measured in order to obtain the value necessary. Since gold’s industrial use isn’t extensive, the supply of gold in the world continues to increase. However, the population increases faster than the quantity of gold available for investment. In other words, the amount of gold available per-person diminishes with each passing day. Unless central bankers release their stockpiles for worldwide distribution, the amount of gold available per person is decreasing by 0.05% per year. In five years it will have dropped to 0.641 ounces (18.2 grams) per person. While inflation has been par for the course ever since President Nixon removed the dollar’s peg to gold, recent years have witnessed unprecedented monetary printing. The M1 supply (dollars in circulation), though it decreased slightly (less than 2%) for about a year (2006-2007), has increased every year for the past decade. During this time it has increased by over 50%, an action that must eventually affect the dollar’s purchasing strength accordingly. In early 2012 the Federal Reserve Open Market Committee made an official announcement, declaring that they would not raise interest rates for at least two years. Such a statement guarantees that current trends will continue at least until 2014. In other words, the American people have been promised that their hard earned dollars will continue to decrease in value for a minimum of two more years.Their reasoning is understandable. Deflation, especially with our economy as fragile as it has been in recent years, would be devastating. From the FED point of view, it’s more preferable to gradually devalue the dollar, buying more time, than allowing deflation to exert its tumultuous forces on U.S. markets. Because of the properties inherent in gold, it is resistant to these inflationary movements. Furthermore, even if deflation did take over, gold has a strong record of sustaining growth in any tumultuous market conditions. The largest gold discovery of modern times set off the 1849 California gold rush and increased the supply of gold in the world faster than the increase in the output of goods and services. The price level in the US did increase by12.4 percent over the next 8 years. That translates into an average of just 1.5% a year. The gold standard at its worst was better than the best the Fed now promises to do with the paper dollar. The folding of many financial institutions may very well be the tip of the iceberg. Derivatives are difficult to understand, but suffice it to say that they are heavily leveraged contracts that result in massive amounts of wealth being transferred. When manipulated successfully, most people don’t realize that they’ve been taken advantage of because of the breadth of the effect. But when they go sour, finance companies, and the portfolios they are supposed to maintain, can be quickly wiped out. We’ve also seen holding companies default in recent years, failing to maintain inventories that matched the paper they’d issued. In other words, they sold what they didn’t have. When it was time to pay up, they had nothing to offer. Stocks of companies that get into financial trouble can be quickly devalued and become all but worthless. Recent political maneuvers, such as those taken with General Motors, also reveal that bonds do not necessarily carry the guarantee that investors once thought. High P/E ratios reveal bubbles in the market, though investors continue to jump in as though such numbers mean nothing. And ETFs are often found lacking in their associated commodities. Personal ownership of physical gold, on the other hand, affords the investor a stable alternative to these paper assets. Though market fluctuations in the short-term can sometimes be influenced, the overall trend of precious metals is not subject to evaluation as paper assets can be. Its value is intrinsic, meaning that its fundamental characteristics guarantee that it will hold some value, regardless of market fluctuations. Throughout history gold has been recognized as a stable form of money. Early economic textbooks recognized its unique place as a monetary asset. And its inherent stability has been a mark of freedom for hundreds of years. Even Alan Greenspan recognized this, stating in Gold and Economic Freedom (1966): An almost hysterical antagonism toward the gold standard is one issue which unites statists of all persuasions. They seem to sense — perhaps more clearly and subtly than many consistent defenders of laissez-faire — that gold and economic freedom are inseparable, that the gold standard is an instrument of laissez-faire and that each implies and requires the other… This is the shabby secret of the welfare statists’ tirades against gold. Deficit spending is simply a scheme for the confiscation of wealth. Gold stands in the way of this insidious process. It stands as a protector of property rights. Gold’s limited supply, coupled with an increasing world population, all but necessitates an increase in gold’s value. If industry begins consuming at a faster rate, this dynamic would be compounded. Inflationary tendencies are destroying the dollar. The destruction of every fiat currency that’s ever existed resulted in flight to gold. It’s simply a matter of supply and demand that dictates gold’s rise in value under such circumstances. Gold is not subject to the manipulations of paper assets. Neither is it subject to poor management, catastrophes or natural disasters. It doesn’t rust, tarnish or even melt easily. Its value is dependent upon its own intrinsic characteristics. When it comes right down to it, it’s as good as… well, gold.